President Nana Addo Dankwa Akufo-Addo has asked the new Secretary-General of the United Nations (UN), António Guterres, to provide the leadership that will reform the entire structure of the UN and deepen international co-operation. 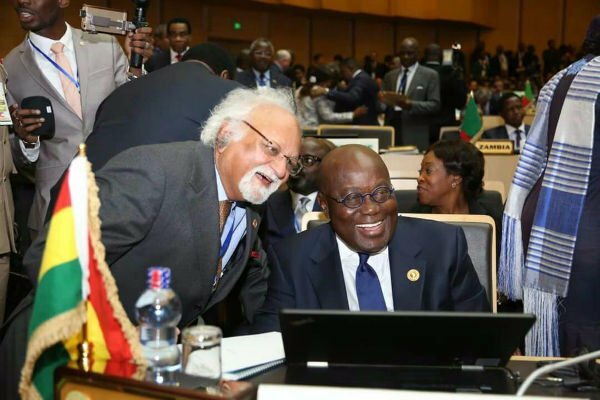 According to President Akufo-Addo, the reform of the Security Council had been the most debated topic at the UN since 1993 and stressed the need for the new Secretary-General to ensure that the council was reformed during his tenure of office. The President was speaking at a breakfast meeting between the African Heads of States and Mr. Guterres ahead of the Ordinary Session of the 28th Assembly of the African Union (AU) at Addis Ababa in Ethiopia on Sunday January 29. He urged the new UN Secretary-General to ensure the realisation of the Ezulwuni Consensus, a position on international relations and reform of the UN agreed by the African Union in 2005. He recounted how he, as Ghana’s Foreign Affairs Minister and Chairman of the AU Ministerial conclave in Swaziland in 2005, together with his colleague AU foreign ministers drafted the Ezulwuni consensus which called for a more representative and democratic Security Council. The goal of the AU, as contained in the Ezulwuni Consensus, was to be fully represented in all the decision-making organs of the UN, particularly in the Security Council, which is the principal decision-making organ of the UN in matters relating to international peace and security. Full representation of Africa on the Security Council would mean having not less than two permanent seats with all the prerogatives and privileges of permanent membership including the right of veto; five non-permanent seats; and that the AU should be responsible for the selection of Africa’s representatives on the Security Council. Nearly 12 years down the line, President Akufo-Addo lamented the little progress made so far and urged Mr. Guterres to hasten efforts towards the full realisation of that consensus. With the new UN Secretary General advocating “conflict management and prevention” as one of his topmost priorities in office, President Akufo-Addo expressed concern about the growing rift between some AU member states and the International Criminal Court (ICC). His concern was hinged on the fact that as many as six African countries in 2016, namely Gambia, Burundi, Uganda, Namibia, Kenya and South Africa, announced their intentions to pull out. President Akufo-Addo called for a closer engagement between the AU and the UN in the spirit of mutual respect and trust, and reiterated Ghana’s continued support and confidence in the ICC. Addressing the meeting, in his opening remarks, the Chairperson of the AU, President Idriss DébyItno of Chad, outlined the areas of immediate concern to the AU. These concerns are in the areas of peace and security, as well as the harmonisation of the implementation of the Sustainable Development Goals (Agenda 2030), which was adopted by the UN General Assembly in September 2015, together with the AU’s Agenda 2063. The meeting was also addressed by the outgoing Chairperson of the AU Commission, Dr. Nkosazana Dlamini-Zuma, who, not only underscored the need for the UN to take Africa’s concerns seriously, but also the AU’s new approach to the funding of peacekeeping operations on the continent. At the 27thOrdinary Session of the AU held in Kigali, Rwanda, in July 2016, African leaders agreed to create a peace fund that would enable the continental body fund at least 25 per cent of the cost of peacekeeping operations, with the remaining 75 per cent being absorbed by the UN with resources from member states’ assessed contributions. The Chairperson of the AU Commission further called on the UN Secretary General to adopt a single reporting mechanism for the implementation of both Agenda 2063 and SDGs. On his part, the UN Secretary-General welcomed the issues raised, and emphasised that without Africa’s strong participation and contribution, the UN’s initiatives aimed at resolving current global challenges would not achieve the desired results. Therefore, in his view, the global order had to be urgently reformed to enable Africa play a central role in world affairs.